BASED OUT OF GRAND RAPIDS, MICHIGAN! I leave a piece of my heart at every wedding I shoot...so watch out, there are pieces of me all over the world...ok creepy...anyway, its so hard choose favorites but here is my shot at some of my favorite images. weddings are about you two, so do your thang! whether you meet me here in downtown grand rapids, michigan or we catch a flight to a destination location world wide, engagement sessions are a great opportunity to get to know each other and get used to working that blue steel face of yours. visit the galleries for some of my favorite wedding and engagement photographs or follow me on social media to see what i’m up to today! if you would like to see a full wedding or engagement gallery to see what an entire shoot with me as your photographer would look like, don't hesitate to ask and check out my instagram for even more of my favs! out of Grand rapids, michigan! My husband and I had never taken professional photos together and we were both a little nervous going into the engagement session. But, O’Malley made us feel so comfortable. She found the location, told us exactly what to do, and took all of the stress off of us. During our engagement season, she was so encouraging and incredibly organized. She helped put together a list before our wedding day of the exact photos that we needed. She spent time throughout this process getting to know us so that she could deliver photos to us that would match our personalities & style. – The day of our wedding, O’Malley calmed nerves, laughed with us, captured memories that we’ll forever have on the walls of our home, and was a joy to work with. She took on the role of “wedding planner” at times and offered help even if it didn’t fit in her job description. – O’Malley does more than take pictures. Her talent and passion allow her to capture experiences and memories that translate in all of her work. You can feel the emotion in each wedding picture she provided; each photo is a piece of art. I would recommend anyone choosing O’Malley for their engagement session, wedding, and any other life-changing experiences they want captured. My husband and I hired O'Malley for our Chicago October wedding. She is *absolutely* amazing. Communication from the beginning was always easy, she answered any questions we had, and made us feel comfortable from the get go. The day of the wedding she was sweet, energetic, and so great to work with. 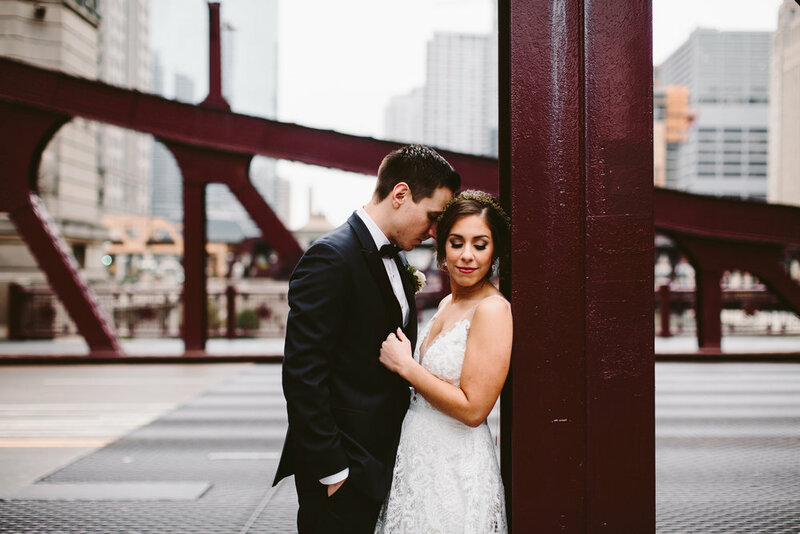 She made our wedding party feel comfortable, she stuck it out during a long cold day, and she captured the most beautiful images from our big day. We love you O'Malley! Working with O’Malley was hands-down one of the best wedding decisions we made! We researched a lot of photographers leading up to the wedding, and chatted with a few. After our initial consultation, we knew she was the perfect fit. She made the whole process incredibly easy and stress free. O’Malley managed to capture the day beautifully and it was beyond what I had imagined! She took the time to scout out the area beforehand and had a lot of great places to take us and so many ideas that we loved. She made me feel comfortable in front of the camera which was a big concern of mine. She is also a jack-of-all-trades. On the big day she was happy to jump in and help out with boutonniere pinning and dress bustling. By the time the big day had come around it felt like I was seeing an old friend. :) She goes above and beyond, and I would highly recommend working with her if you have the chance!